Street art has some truly messy roots, even by the standards of the art world. Essentially starting out of the graffiti movement (if it can even be called that in its infancy), the works were inherently illegal from the very beginning. An entire subculture was spawned outside of the realms of the supposedly civilized art world, and like all subcultures, it developed its own rules and social taboos. One of them involved the taboo of painting over another's work - provided it was a genuine work of art (by the standards of the subculture). It was still done, of course, but it wasn't merely accepted practice but could be taken slap in the face of the artist whose work was being covered up. However, there grows a kind of interplay between the various artists if they don't know each other, a kind of narrative that is established by their interactions with each other through their works. Banksy, of course, changed the entire world of street art by becoming a valuable commodity. When street art was treated as a public nuisance, nobody in the dominant culture paid any attention to the squabbles of those they saw as essentially criminals. But once Banksy appeared and captured the hearts, minds and dollar bills of the art-loving public, street art suddenly began to get noticed. A number of thorny and tangled legal issues emerged, such as the ownership of a work created partly using materials owned by someone else (say, the wall of the youth centre we mentioned in our last Banksy article). So when Banksy's latest work, Girl with the Pierced Eardrum, a takeoff on Girl with the Pearl Earring by Vermeer, the art world is in a bit of a dither as to how to respond. Frank Malt, one of the most noted authorities on street art and street artists in the UK, said “Banksy puts the work up for the public to enjoy but people are exploiting it. 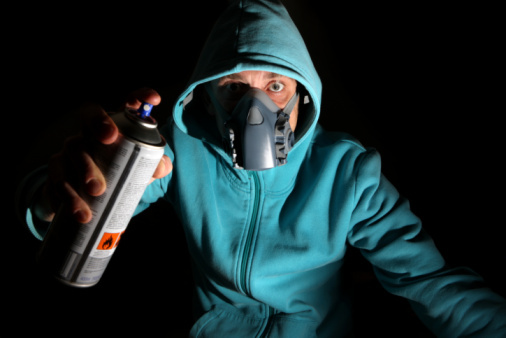 People think it’s fun to deface Banksy’s work because they may get a name for themselves. Girl with the Pierced Eardrum could have been defaced by anyone – it could have been kids wanting a bit of attention." The interesting thing is that there has yet to be a reaction from Banksy as to how he feels about the supposed defacement. It's not like he can really place any formal objections to how his work is treated, as it is still technically criminal in nature. However, it would change the entire nature of his work if he started creating it for the express purpose of building a dialog or narrative with other artists. How cool would that be?